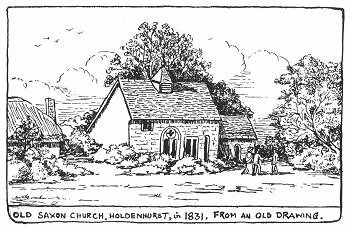 The Old Saxon Church was situated about 100 yards down the lane to the right of Bramble Cottage (c 1660). 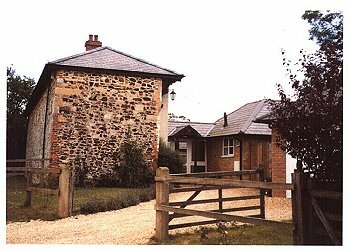 Today in 2007 there still remains the three outer walls of the church which now form part of two new properties built within. 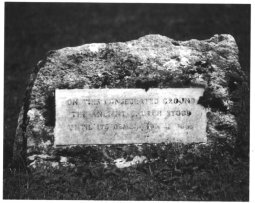 The area of grass adjacent to the lane and infront of the Saxon wall is now designated consecrated ground and there is a featured stone bearing an inscription. 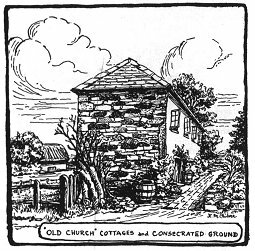 Prior to the building of No's 21 and 22 the outer walls enclosed three small terraced cottages (circa 1835) pictured below. "ON THIS CONSECRATED GROUND THE OLD CHURCH STOOD UNTIL ITS DEMOLITION IN 1839"
During the digging of garage footings on land belonging to Bramble Cottage a portion of the old Saxon Church window was unearthed - This corner section of window can be seen diplayed within the brickwork of the front of the garage. 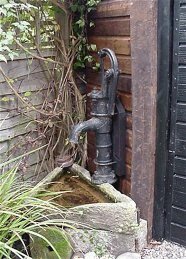 Also to be seen below the window section is an original village water pump or 'Tubewell'.